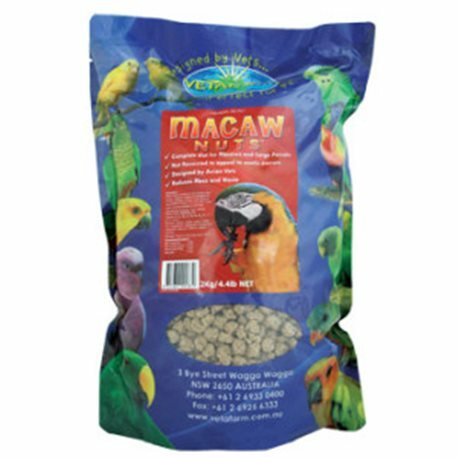 Completely balanced extruded pellet diet specifically designed to meet the particular dietary needs of South American Parrots. Recommended for: Macaw Nuts recommended for larger Parrots such as Macaws. Macaw Nuts can be used for any pet or breeding South American Bird. Can use with: Macaw Nuts are complete diets; no additional dietary supplementation is necessary. Fruits and Vegetables can be given as behavioural enrichment. My bird was bred on pellets that were made in USA & could only be bought in 2 areas. I found they were getting more & more expensive so decided to try her on the smaller macaw nuts instead, we haven't looked back. Much more affordable & was so happy when they decided to make these a smaller size.